Number of control points that fit to the data set. number of control points must be greater than degree. Order of polynomials that form the B-spline curve and fit to the data set. Method that computes the interim knot vector. equally spaced 0 Uses the equally-spaced method. chord length 1 Uses the chord length method. centripetal 2 Uses the centripetal method. Y-values of the B-Spline curve that best fit the input data set. X-values of the B-Spline curve that best fit the input data set. Weighted mean square error of the fitted model. The standard B-Spline basis functions construct the B-Spline curve (x'i, y'i). 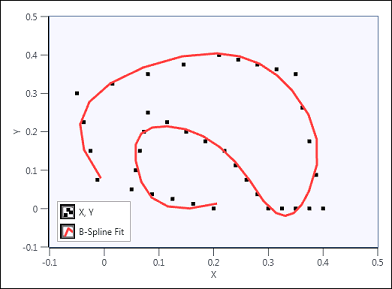 The following illustration shows a typical B-Spline Fit result.